The title of today's story, "A Girl Who Wanted Three Husbands", trumped for me the title story from its book, The Bird of Truth and Other Fairy Tales. This was even though Andrew Lang included "Bird..." in his The Orange Fairy Book and another tale, "The Knights of the Fish" is in the also respected Tales of Wonder Every Child Should Know edited by Kate Douglas Wiggin and Nora Archibald Smith. Here's the story about that girl. I'll add a bit more about the book and its author after the story. O.k. it's not the shortest story in the book, but I just had to read it. 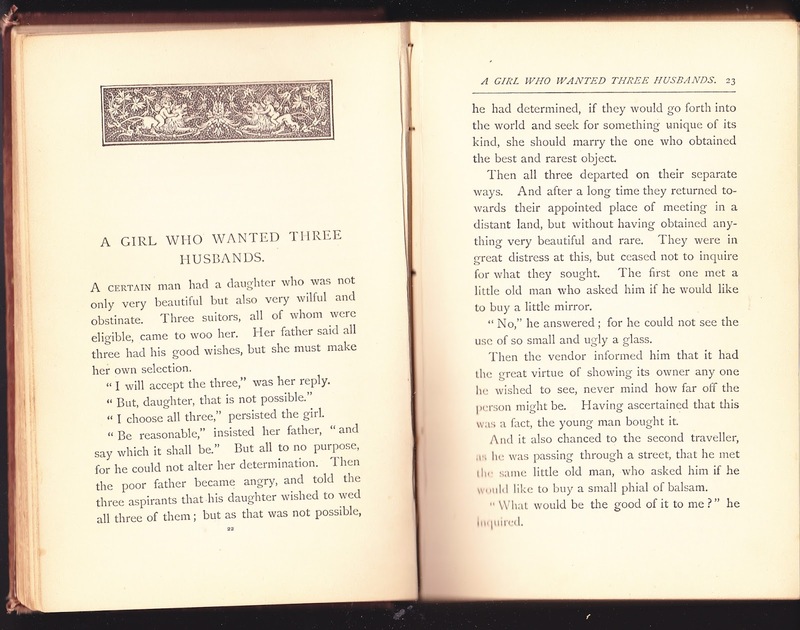 Yes, it includes a few common themes, but it does still end (maybe a bit abruptly) with her still wanting three husbands. What a refreshing change from all those kings (and others) who gave away their daughters without letting the girls decide. Now a bit about the book, it can be found at Luna, an online archive of Public Domain books from University of Colorado - Boulder. 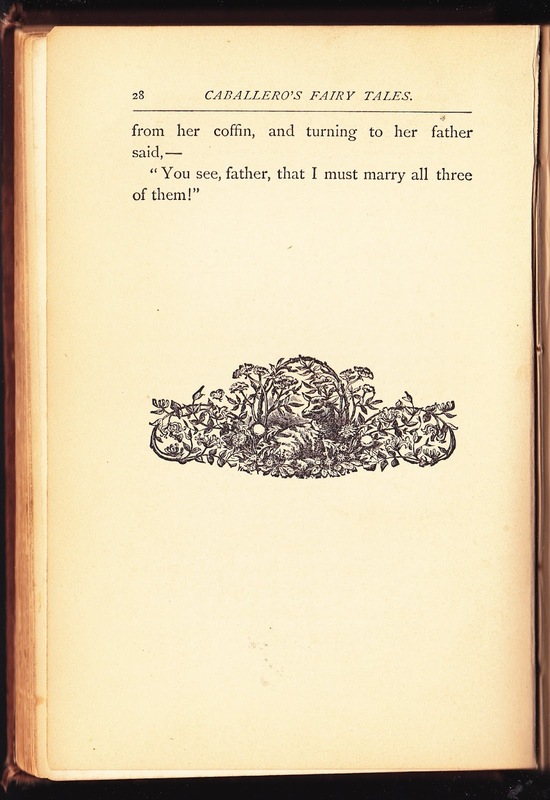 It's under its alternate title, found on the title page as Spanish Fairy Tales which is the translation by J.H. Ingram. The author is listed as Fernán Caballero, but the translator tells us that's the pseudonym of a lady without naming the Spanish novelist, Cecilia Francisca Josefa Böhl de Faber. Ingram's edition doesn't name the illustrator either. There's a Wikipedia article about Caballero, but it doesn't mention this book, considering her only as a novelist. 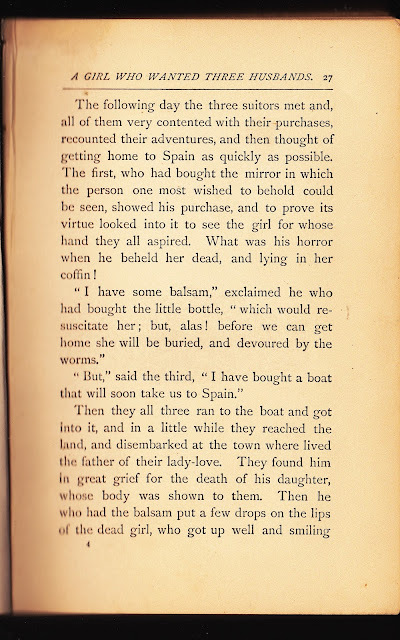 The title story, The Bird of Truth, however, earns a very thorough synopsis of the complex story and also says: The Bird of Truth is a Spanish fairy tale collected by Cecilia Böhl de Faber in her Cuentos de Encantamiento. 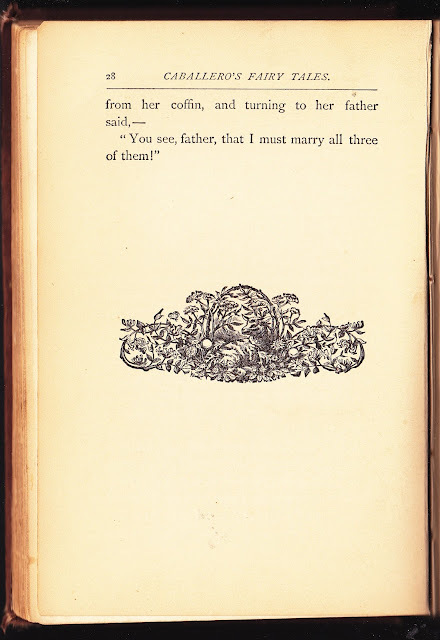 As if all of that isn't confusing enough, the Luna site also gives yet another alternate title, Caballero's Fairy Tales. 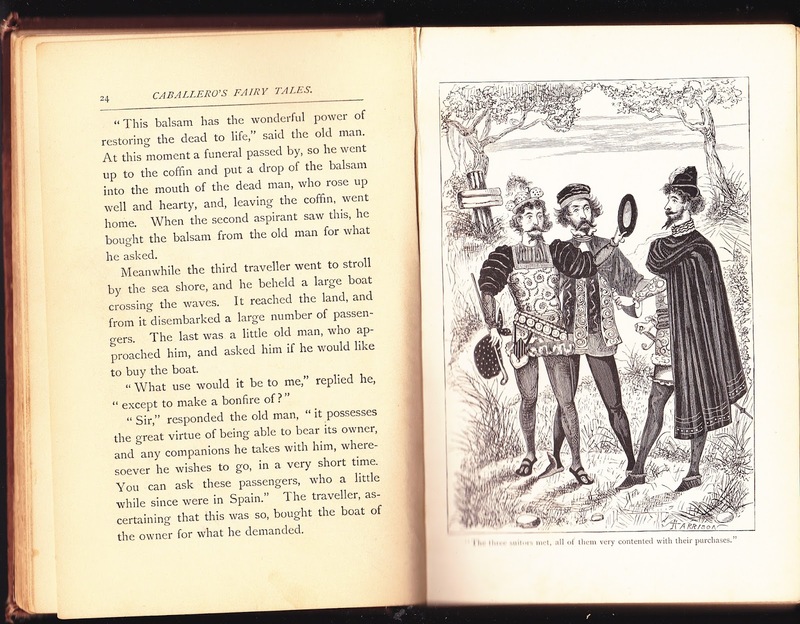 Since "Caballero" died in 1877, we know it's Public Domain and it is also included in Index to Fairy Tales, which was published in 1915. J.H. Ingram says many of the stories are from Andalusia, as well as noting many stories "are evidently transplanted from a foreign soil." Yes, but we know how folklore travels, so that's no problem. 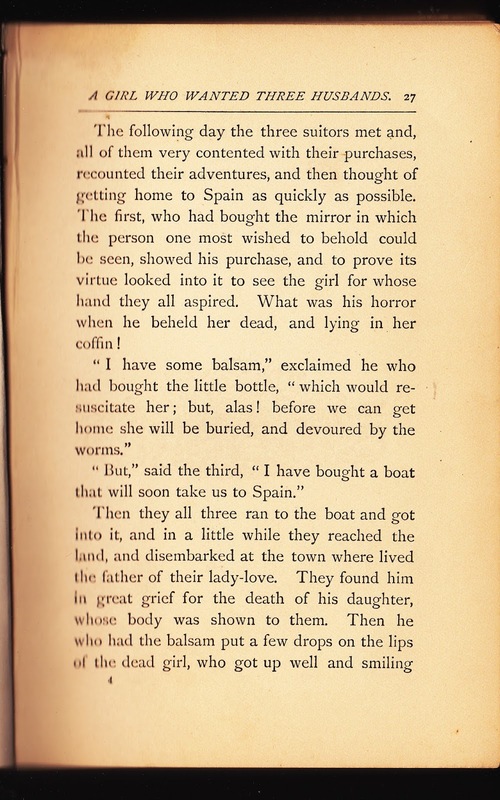 For anyone able able to read the original Spanish, Cuentos de Encantamiento, has 23 of the original 33 stories including this "La niña de los tres maridos." ¡Qué maravilloso!